Originally intended as a multi-part television series, the new, Netflix-backed Coen Brothers movie has instead become an anthology film, comprising six stories of the American Old West. Each tale is presented as a chapter in a dusty storybook, complete with a painted illustration that prefigures a moment in the story. 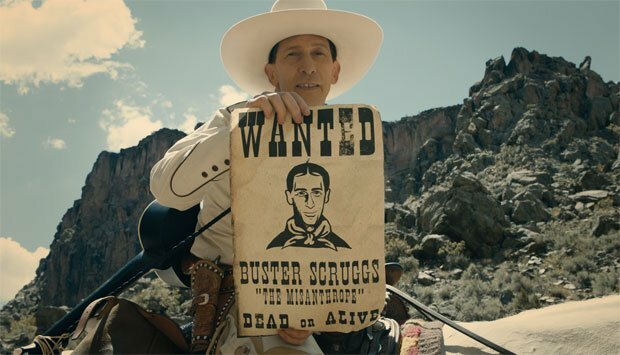 The film opens in high style with the titular tale, in which singing sharp-shooter Buster Scruggs (Tim Blake Nelson), resplendent in a white suit and hat, gets himself into a spot of bother in a cantina full of bad hombres. Showcasing Nelson's "pleasing baritone" and peppered with great dialogue, it's a hilarious tale enlivened by the Coens' signature moments of sudden comic violence. Its somewhat unexpected ending holds the key to the rest of the film, as each segment becomes increasingly more melancholy, exploring themes of death and the stark brutality of the Old West. Accordingly, the remaining tales are both haunting and macabre, beginning with James Franco as a decidedly unlucky bank robber in Near Algodones and moving on to Liam Neeson as a travelling showman with a quadriplegic orator act (Henry Melling) in 'Meal Ticket'. Similarly, Tom Waits is outstanding as an ageing prospector in 'All Gold Canyon', while Zoe Kazan is heart-breaking in the film's best segment, 'The Gal Who Got Rattled', as a woman finding touching romance on a wagon train to Oregon. The final tale, 'The Mortal Remains', features Tyne Daly, Brendan Gleeson and Saul Rubinek as three passengers on a stagecoach to...well, that would be telling, but it provides the film with a perfect ending, the deeper meaning of which only really sinks in as the credits are rolling. The Coens' love of westerns is well established and each of the stories is impeccably crafted, from Bruno Delbonnel's stunning cinematography to Carter Burwell's wonderful Western themed score and Jess Gonchor's gorgeously detailed production design. A treat for Coen fans and Western fans alike. Screening on Fri 12, Sat 13 and Sun 21st Oct as part of the BFI London Film Festival 2018. Available to watch on Netflix from November 16, 2018. Anthology film comprising six stories of the Old West, presented as a chapter in a dusty storybook. By turns hilarious and macabre, with each story impeccably crafted. A treat for both Coen fans and Western fans.